This was a quick snack I put together this past Friday night… another spin on pizzas. I took [rectangular] pizza dough [store bought or homemade] and topped it with marinara sauce. On top of that I added: garlic powder, red pepper flakes, oregana, shredded mozzarella cheese and grated parmesan cheese. Roll it into a log [as neatly as you possibly can]. And using a sharp knife, cut them into even pieces. Lay them on a baking tray. I baked it in a preheated 350 degree oven for about 12-15 minutes and it was delicious! I must be in a pizza-craze mode, because I have experimented with pizza-style recipes several different times in the span of a few weeks. By the way, you can find other Pizza-styled recipes of mine by clicking here. Anyhow, back to the Pull-Apart Pizza Bread I made this past Friday. It’s, of course, another fun twist to pizza. On a floured surface, so your dough doesn’t stick and is easy to work with, roll your pizza dough out into a large rectangle. This second step you can do two ways. You could either, at this point, top your rolled out pizza dough with sauce, cheese, and whatever other topping(s) you’d like… and then cut them into squares. Or you could do what I did because I didn’t want to have to deal with the messiness factor. It’s messy, anyways, my way… just not as much. What I did instead was: cut my dough into squares, top each square with marinara sauce and cheese (you could add other toppings if you’d like at this point). It’s more work this way because you have to individual add it to each square, but I preferred that over having to cut through pizza dough that had everything on it already. Once you have all your squares, stack up the squares onto of each other, and stack into a [non-stick] loaf pan that you have sprayed with non-stick cooking spray. I created several smaller stacks, just so it was easier to transfer them into the loaf pan. Cover your loaf pan with plastic wrap, set it aside, and allow it to rise [for at least 30 minutes]. 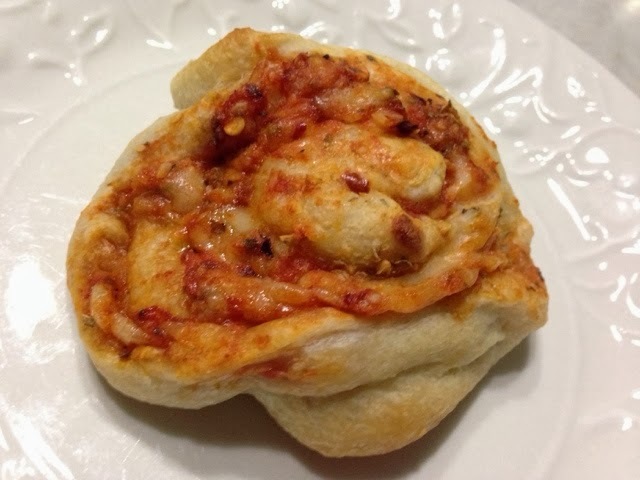 Baked your Pull-Apart Pizza Bread for about 20-25 minutes, or until the top is golden brown. Allow to pizza to rest for a few minutes minutes before flipping it [gently] onto a serving platter. I’d recommend serving it with additional [warm] marinara sauce.